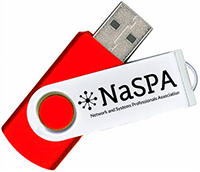 Help support NaSPA and earn a special gift for yourself and an associate. Ask your employer to register your company at careers.naspa.com. It just takes a moment, and there is no charge. Email us at join@naspa.com with the name and email address of the person who places employment ads, and use the subject line: Gift Card. * Limited time offer. Non-NaSPA members are eligible too, and will each receive a $10 gift card. Another good reason to JOIN NASPA!